Communications are probably one of the single most important topics on trips that are undertaken that are not solo. To ensure that everyone understands what is intended, we must all communicate the plan and we must do it well. Well Kim and I have used a number of the two way motorcycle communicators and we’d like to tell you about our experience with the Sena SMH-10. Overall, we’re pretty pleased. 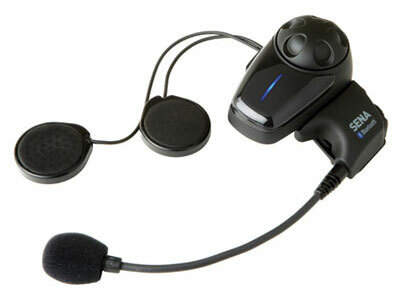 By way of background, the Sena SMH-10 is the first Bluetooth communicator we have used. Previously, we had used the Collett series of radios the last being the Collett Platinum 900. While we found the communicators to be good performers, we did not find their reliability to be so great. They do have a 3 year 100% warranty and Collett does honor their warranty well, but who wants to have the down time associated with yearly repairs which is what we experienced. So back to the Sena’s. Overall we’ve found the range performance of the Sena to be pretty good especially considering that it is a bluetooth device. Sena claims a reception range of “up to” 980 yards (900 meters). We’ve found that the distance in unrestricted terrain to be somewhat less, perhaps 500 – 700 yards at best. Frankly, if you are riding with friends, how often are you more than a quarter mile from them? If you are going to be that far away, perhaps you should call them on the phone, eh? For us however, the real world test of performance is in more restricted space such as in the woods or around corners in twisty terrain. Here, the range of the Sena varies significantly. If you are in the city and are several turns ahead of your riding partner cut off by buildings, range is signifcantly decreased. The same goes for being in the woods. The more dense the terrain, the shorter the range of the communicator. However, we can say with confidence that with all our adventure riding in non-densely wooded terrain, the Sena has given us totally acceptable reception. This is really important to me as I like to know how Kim is doing when we are in the woods and I don’t always have her in sight. I believe the same goes for her wanting to keep tabs on me. As far as range goes, we’ve seen as little as 100 yards in the woods, but frankly we were really buried in there. If you’re looking for a communicator strictly for the woods, you probably do want to look elsewhere though. 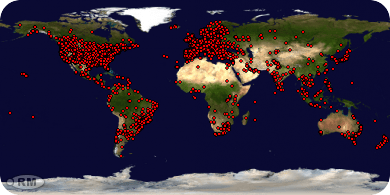 As you can tell from R2ADV, we have ridden all over the world and we ride in all sorts of weather and conditions. We are constantly riding in the rain. Pouring rain; as in downpours for hours. We continued to use the Senas in these conditions and we can report that the Sena did not suffer an water related failure in 2 years of use. That’s something that the Collett couldn’t claim. We ended up returning the Colletts 3 times in 3 years for repairs. We also ride a lot of gravel and in very dusty conditions. Both in South America and during last years Trans American Trail ride, we rode extensively in very dusty conditions where visibility was almost nil due to the bike in front or an ocassional vehicle we caught up to or passed coming from the opposite direction. We literally were covered in thick dust at the end of the day and the Senas still worked flawlessly. The Sena’s charge fairly rapidly. Ours are the V3.0s and the V4.0s are now widely available. The V3.0s will fully charge in 3 – 4 hours. Sena claims that the V4.0 will charge in 2. We can’t confirm that claim since as we said earlier, our experience is with the V3.0. but it seems a bit strange to this non-engineer that a firmware update would reduce the full charging time. Perhaps an EE can comment in our comment section and voice an opinion. Ultimately, after two full hard years of use, we have experienced some problems with one of the Senas. One unit must be positioned just right to receive a charge. It seems that there is a poor connection inside the unit. In addition, the audio has become extremely distorted and has almost become unuseable. It transmits well, but the receive audio is so bad it is almost impossible to understand the incoming communication. Since the Sena comes with a 2 year warranty and these units are out of warranty. Unfortuately, we won’t be able to test Sena’s warranty support on the older failing unit. However, we do have a replacement pair that were shipped to us new in non-working condition, so we’ll let you know how Sena handles their warranty service as this plays out. So when all is said and done, would we recommend the Sena SMH-10. The answer is a fairly enthusiastic yes with a couple of caveats. As long as you are not depending on the Sena SMH-10 for 100% woods riding, or very long distance communications, the Sena is a pretty good tool. Our experience has been with these kind of electronics, a couple of years use is about what you can expect to get for service. Priced at about $300 for a pair, they are not inexpensive, but for the communications, added bit of safety and overall communications, we think they are worth it. We hope you found this review helpful. This entry was posted on May 23, 2012 by Ride2Adventure. It was filed under Adventure, Adventure Motorcycling, dual sport, enduro, Motorcycle, off road, Overland, product review, Travel, Uncategorized and was tagged with adventure, adventure bike, communicator, dual sport, enduro, kimike, motorcycle, off road, overland, product review, ride2adv, ride2adventure, Sena, SMH-10. Even though I have never used these gadgets, I think it’s very useful for people that have a need for it. So, keep on giving your opinion about all the gadgets you use since I’m sure it’s of great service for many of your readers. Thanks Willy, we’ll keep on trying to give good info. Thanks for continuing to give us great feedback! We have the Sena SMH-10 also and while I’m not a Bluetooth fan, this beats having wires to connect. Unlike the writers, Mike and Kim, we ride 2-up and not on dusty roads so no problems with dust and distance between units, however we have found that they work fine over a remarkably long range. We use the capabilities of our units to the ‘max’, having a Zumo 550, a smart phone and an iPod. A puzzle to setup, but once done, great everything works! (we have to ‘wire’ the iPod into both units for music, but understand that their, soon-to-be-released SR10 will provide wireless connection for the music as well. Altogether I would rate the Sena SMH-10 a very good set, with tremendous support and I am very pleased that they now also accommodate Mac for software updates. V4.0 is proving to be a good release, lots of new features. Thanks for the excellent comments astechman. We’re sure that everyone will benefit from the extra info you provided. Please keep on visiting and providing great feedback like the above!